Just a little post to note that at the end of August, 2017, I did both my ATS® General Skills and Teacher Training, and therefore I am a qualified ATS® teacher, although I won’t be teaching for a while yet, and I want to get more experience on other areas before I do so. I want to write about both GS and TT in more detail, but for the time being, this should be enough as a reminder of the hard work and the five years that went into achieving this. 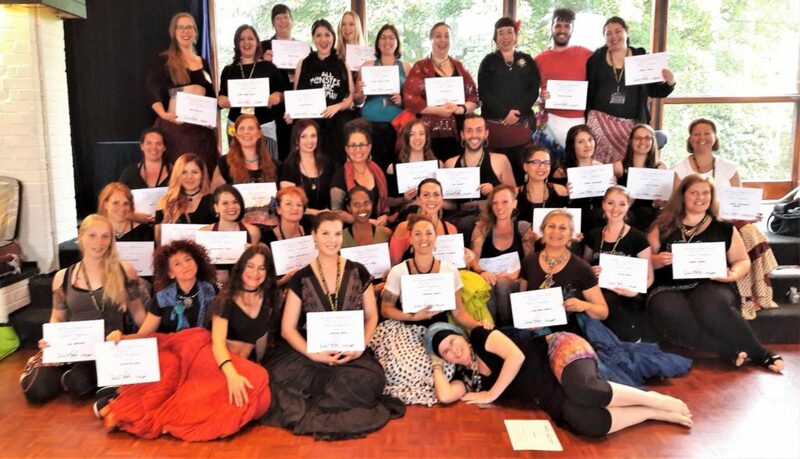 Tara’s workshop at Orient Expressions last year was the very first time I attended any type of workshop, and where I realised that I was at a level to benefit from them. I did enjoy it, so I was curious when she came up again as a guest teacher this year. The subject would be Khaleeji (or Khaliji, Kaliji and other variations). 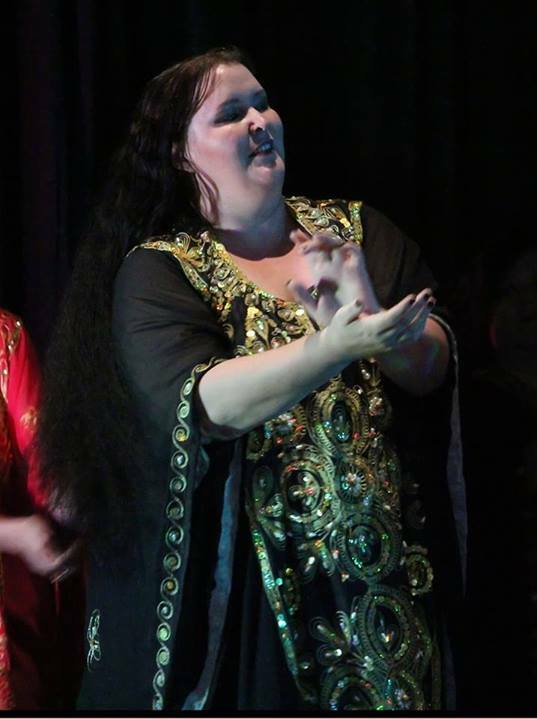 The word means, literally “of the Gulf”, and within the dance community, it refers to music and dances of the Persian Gulf. Tara worked there for a while, and while I wasn’t terribly caught by the idea of dancing with big thobes (check the photo to the right to see what I mean), I wanted to learn more about the style from someone that had experienced it first hand, instead of hearing every now and then something like “this is a bit of khaleeji” when what they really mean is “this uses footwork like that of Khaleeji”. Tara explained to us the basic steps and moves that we would encounter, why they were so centred around the head, hands, and upper torso (easy, the thobes do cover pretty much everything else), although we did have some hip moves later on. She said we would work on a pop Khaleeji, and did mention that nowadays most people danced to it just wearing street clothes, unless they were dancing for heads of state or doing dance shows. She also read us the translation of the song we would be dancing to later, so we had a better idea of what it was about. Mena and Shaira wearing thobes . We started with a warm up that focused on the ankles/calves, hands, torso, and neck, and with a bit of hip thrown in. She then covered the basic footwork (rather simple) and some other moves that we could encounter, mostly including arms, “showing off jewellery” as she called it, or mimicking heart beating, floating in front of the body, or framing ourselves. Then followed turns and travelling that mixed all that we’d done up to that point. The style very often requires the arms to be extended away from the body (check the photo to the left for an example), and this is one aspect where my ATS training came handy, but it was still rather hard work! Then we covered the hair tossing and turning with it. This wasn’t as bad (read: disorienting) as I expected it to be, although I did make sure I was driving the move with my upper body instead of just the neck, but for some of the turns you just had no other option when bringing them back up… Think of it as hair tossing of the kind you’d encounter in a shampoo commercial, and you won’t be that far off the mark. I hadn’t danced with my hair loose in a long while and it was rather exciting to be doing all this moves with it, but as my hair is far longer now than when I started dancing three years ago, and it was hard work so it was heavy with sweat, it did take its toll, and I am still feeling some side effects from it. She did give us a quick primer on floor work, but considering the effects kneeling down without padding has on my knees, I opted out of it. After the introduction to the basic moves, Tara guided us through a bit of a drill, and then let us do about a minute or two of improvisation so we could feel the music and get the right attitude for it before starting work on the choreography. The choreography was pretty, quite feminine and sweet, and Tara made sure to remind us of the lyrics so we could imbue each move with the appropriate feel, which was good… quite often that aspect is left out of choreographies and everything ends feeling a bit robotic. Tara also let us video the whole chunk of choreography we learnt by the end of the workshop, which will be good to have as a reference point if I want to revisit it in the future. My *one* nitpick (and it is really a nitpick, not a real negative) is that we did seem to work on the choreography by going over the whole thing every time and then adding a new chunk, which means that each successive part got less and less practice time. So you have a fully polished first combo, as it’s been done so many times, but each successive combo has had less and less time dedicated to it, and is therefore less polished in comparisson. I know a lot of people work better this way, as they need to learn the whole sequence one after another, but I’ve always found it more efficient to practice each chunk/combo by itself the same amount of times, and then practicing the transitions between one combo and the next. Final impressions: the workshop was a good balance of information, technique, and a choreography to reinforce the other two aspects learnt. It was a great way to get a good overview of the style with someone who obviously enjoys it. Would I take another workshop on Khaleeji? No. This isn’t because of Tara’s instruction, which I think was very good. It was fun to learn about the style, but I just don’t think it “calls me” to do more research into it, or to dance it, although I suspect some of the gestures and moves might creep into my usual dancing. Would I take another workshop from Tara? Very likely, depending on what it is. She’s fun, obviously very dedicated and encouraging, and explains things clearly. I took this workshop on the same day I took Alexis’, so I was tired, but that didn’t stop me. 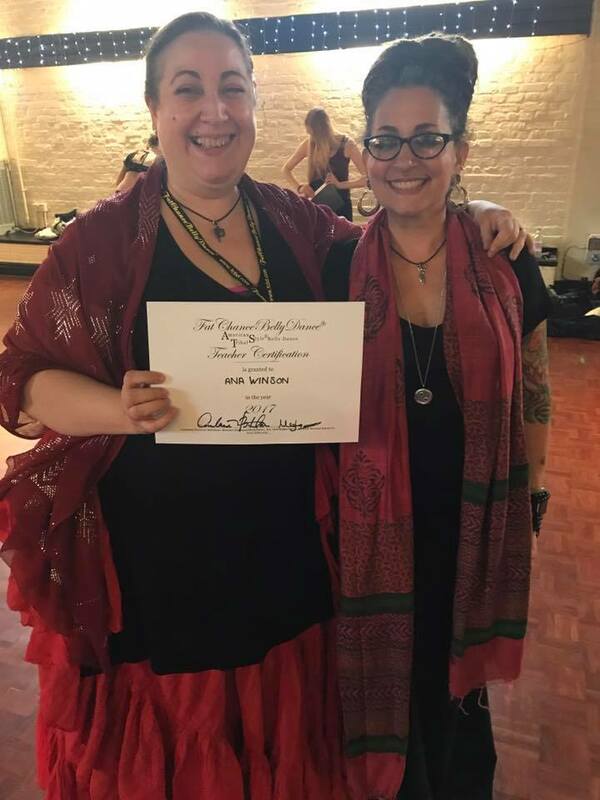 Now, in the interest of disclosure, Hilde also happens to be my Tribal Fusion teacher, and I’d already taken a workshop with her before at Orient Expressions, but the concepts she was covering this time are a bit more abstract. Basically, Hilde uses her background in Choreology and mathematics to view a completely different point of view to dancing, including a whole new sense of your space, body, and relationship with the audience. A lot of these concepts also, quite interestingly, overlap with traditional arts concepts like planes and symmetry. And if you have a background in 3D, like I do as part of my day job, then it becomes even more interesting. Hilde introduced concepts like kinesphere, planes of movement, symmetry, dynamic oposition, rebound and locks, and how these started shaping our dancing and our moves. From the start, even with the warm-up, we took this concepts and applied them to become more aware of what they meant and how they applied to our specific style of dancing, there was a lot of exploration of space not just for ourselves but also in relation to dance partners, and I do remember having a fleeting amusing thought about how that can go wrong when a venue invites 10 dancers to a stage the size of a stamp and expect all of them to dance on it. We then worked on a medium length sequence where these things came into play, with the idea that we should try to identify all of the things that were happening, and why. The combo used modern dance as well as belly dance moves, and exemplified a lot of the concepts used. Overall impressions: this workshop does sound initially like it would be good only if you’re thinking of starting to choreograph, or if you already do, but trust me, it will bring a whole new level of understanding to your own dancing, and those of others. Don’t get me wrong, if you do choreography it will be invaluable, but even if you mainly do improvisation, committing the concepts to heart should aid you about how you approach your dancing, how you position yourself for your audience, and even the sort of movement you do, postures and gesturing. Would I take another workshop with Hilde? I take weekly classes with Hilde and I feel very privileged for that! She’ll be doing a Choreology Intensive in February, and hubby has booked me into it as my birthday present (all together now: “Awww!”). Spaces right now are extremely limited, but if you want to know more, head over to Hilde’s Website. 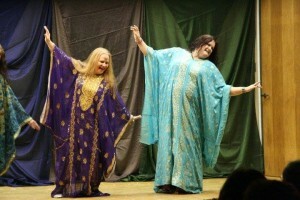 Hilde will be teaching this same workshop next year at TribalFest! More info at the TribalFest website!